For the longest time I've been wanting a Pandora charm bracelet. I love the idea that it's so personal an individual to each person. I also thought the patented technology behind the bracelet, clips and threading is really interesting. The bracelet has two threads, each a third into the chain. Alongside two threads either side of the clasp. 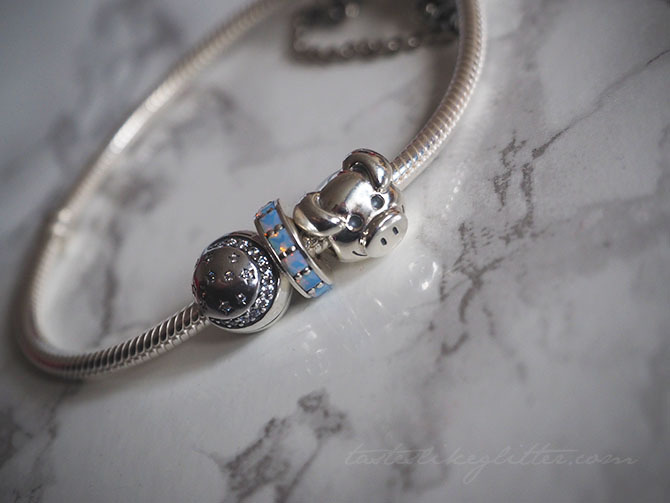 The theory behind the threads is that the majority of Pandora charms are able to be threaded onto the bracelet, meaning if you take it off or the clasp happens to break your charms won't slide right off. 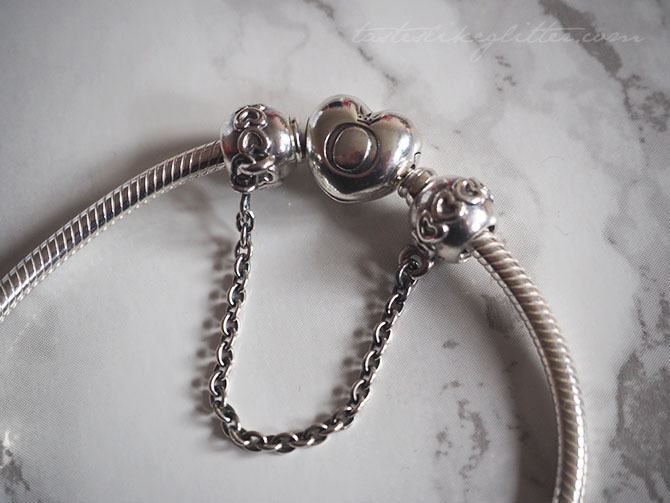 The two threads on the bracelet are made to house clips, which are a different kind of charm and as the name suggests, they clip right on and stay in place. 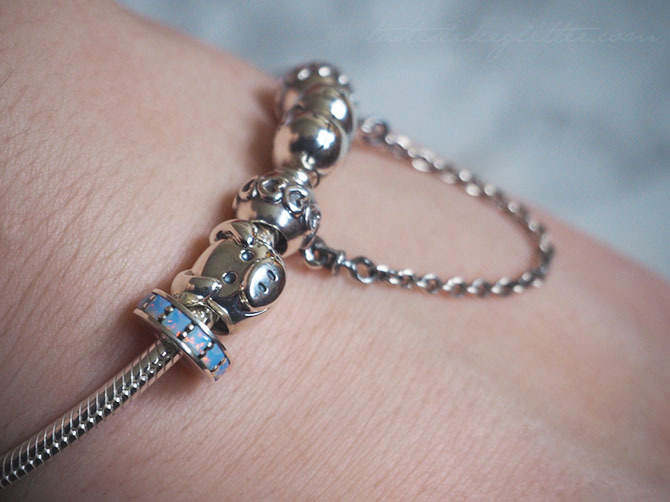 Preventing your charms from sliding up and down your bracelet. I thought I'd give you a run down of what I currently have on my bracelet because I love it and it just makes me smile. I can't wait to add to it. This heart clasped version is a different take on the regular round clasps, which is what drew me to. I think it just looks so sweet. 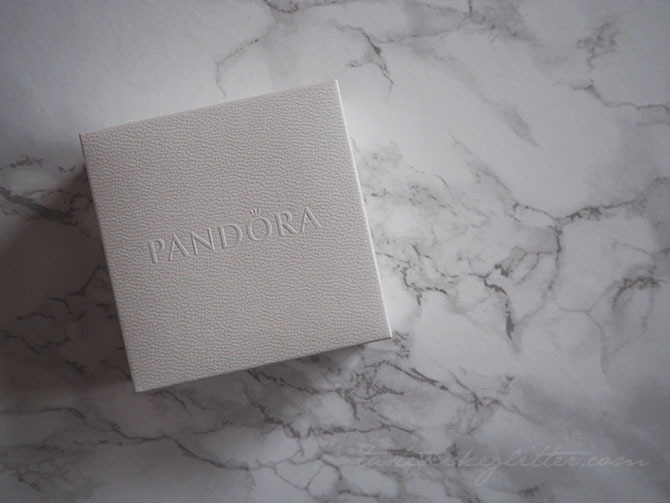 On one side the Pandora symbol is engraved and the other side has the brand name. I did find it fiddly to do up at first because where the bracelet is attached to the clasp, they're both placed at different angles rather than being horizontal and aligned. The snake chain starts off quite rigid and stiff but with wear it loosens up after a while and becomes more comfortable to wear. I wanted to pick one of these up eventually but I ended up doing it sooner rather than later. This helped with fastening it one handed due to stiffness that bracelet has to start with, you end up just chasing it around your wrist. Pandora only have a very small selection of safety chains and this ended up being the only one I liked. First thing I knew I needed alongside a bracelet was a clip. I've had my eye on a couple of the floral ones but since the bracelet and clip were a Christmas present, I opted for a more wintery themed one for now. I'm definitely a night owl and I absolute love stars so I felt this clip would be right at home on my bracelet. The added bonus of all the sparkly little cubic zirconia makes it truly twinkle. This was a Christmas gift from one of my very best friends. It was a lot of meaning behind it to us both but it's something I like to keep for us, you know? But anyway, this adorable little piggy came out towards the end of last year when Pandora released a collection of animal charms. All modelled on the same sort of design they have everything from a cat to a panda, there's even an adorable little giraffe! He has a plain back but his smiling little face always wins me over. Lastly (for now) I have this absolutely beautiful spacer. As soon as I saw the promotional images before it was even released, I knew I had to have it. If you know me you know I love anything shiny, more so if it shines different colours. This charm may be small in size but it is absolutely stunning. The princess cut crystals are a milky looking blue, looking whiter in some lights. When the light hits it fiery oranges and reds seem to glow from within. It truly captures the essence of how opals glow.